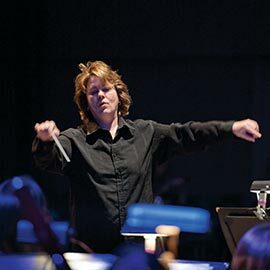 A native of Toronto, I am currently the conductor and artistic director of the Richmond Hill Philharmonic Orchestra and completed a Doctor of Musical Arts degree in Conducting at Arizona State University, where I conducted the Wind Symphony, Wind Ensemble, Chamber Winds and the Lyric Opera Theatre. I hold Bachelor of Music and Bachelor of Education degrees from the University of Calgary, Master’s Certificate in Conducting from the University of Calgary Wind Conducting Program, and a Master of Music degree in Musicology from the University of Manchester (England), where I conducted the Symphony Orchestra, chamber ensembles and the New Music Ensemble, as well as civic, professional and youth orchestras and new music ensembles across the country. Across the globe, I have conducted string and full orchestras, symphonic and jazz bands, chamber music, contemporary music ensembles, and opera and have taught and conducted musicians at all levels, from novice to professional. On top of my role as conductor and associate professor of music at Wilfrid Laurier University, I teach courses in conducting and orchestration. I am active internationally as a conductor, adjudicator and clinician in North America, Great Britain, Europe and South America. Research includes the development of conducting and conducting pedagogy, using digital media, and further studies into emotional contagion and effective gestural communication. 2014 Ontario Volunteer Service Award, Richmond Hill Philharmonic Orchestra. 2012 Mayor’s Endowment Fund for the Arts, Richmond Hill, Ontario (Performance Grant). 2011 Mayor’s Endowment Fund for the Arts, Richmond Hill, Ontario (Performance Grant). 2010 Mayor’s Endowment Fund for the Arts, Richmond Hill, Ontario (Performance Grant). 2008 Award of Excellence (Ontario Band Association). Directed study in advanced conducting method and technique. Kun, Jessica V., A real-time responsive/interactive system for musical conducting using motion capture technology © 2004. Publication at ACM Digital Library: http://portal.acm.org/citation.cfm?id=1037631. “A Real-Time Interactive/Responsive System for Conducting and Conducting Pedagogy Using Motion Capture Technology.” Doctoral dissertation, Arizona State University (2004). “A Comparison of Videotape and Motion Capture Imaging Systems As Effective Feedback Tools in the Analysis of Conducting Technique.” Arizona State University (2003). “Trends in Nordic Music for Symphonic Wind Ensemble in the 20th Century,” Manuscript, University of Manchester (2002) 320 p.
“Performance in Music,” The Ontario Curriculum Exemplar Project, Grade 9, Ontario Ministry of Education (2000). “Music in My Community,” The Ontario Curriculum Exemplar Project, Grade 9, Ontario Ministry of Education (2000). “Music in Society,” The Ontario Curriculum Exemplars Project, Grade 9, Ontario Ministry of Education (2000). “Performance in Music - Curriculum Unit,” Arts Profiles: Grade 9, Ontario Ministry of Education (1999). “Elemental Choices - Curriculum Unit,” Arts Profiles: Grade 9, Ontario Ministry of Education (1999). “Music in Society - Curriculum Unit,” Arts Profiles: Grade 9, Ontario Ministry of Education (1999). “Transition Years in the High School Music Classroom,” The Recorder: The Journal of the Ontario Music Educators’ Association, xxxvi:1 (1993). “Transition Years in the High School Music Classroom (edited),” The Artspaper: The Arts Education Council of Ontario, iii:2 (1993). Gambetta, Charles. “Creating a Fresh Approach to Conducting Gesture.” Reprint from the Journal of the Conductors Guild, Vol. 29 (2010). Gambetta, Charles. “LMA for Conductors: Revealing the Equivalence Between Movement and Music.” Reprint from the Journal of Laban Movement Studies, Vol. 1 , No. 1 (2009). Gambetta, Charles. “LMA for Conductors: Creating a Fresh Approach to Conducting Gesture.” Reprint from the College Orchestra Directors Association Journal, Vol. 1, No. 2 (Spring 2008). Gambetta, Charles. “Conducting Outside the Box: Creating a Fresh Approach to Conducting Gesture Through the Principles of Laban Movement Analysis.” DMA Dissertation, University of North Carolina at Greensboro (2005). Godøy, Rolf Inge and Marc Leman, ed. Musical Gestures: Sound, Movement, and Meaning. New York and Oxford: Routledge, 2010. Mathers, Andrew. “How Theories of Expressive Movement and Non-Verbal Communication Can Enhance Expressive Conducting At All Levels of Entering Behaviour.” PhD Dissertation, Monash University School of Music - Conservatorium (2008). Thompson, James W. “The Effects of Conducting-Gesture Instruction on High School String Orchestra Students’ Recognition Of and Playing Response to Common Musical Conducting Emblems.” PhD Dissertation, University of Utah (2012). My desire to continually grow as an artist and an understanding of the human spirit helps me to engage people to strive for excellence in their own work. Vision, resonant leadership, enthusiasm, creativity, rigor and professionalism are principles that make up who I am as an educator and artistic leader. I believe that students must inevitably become empowered, informed, responsible individuals who value the quality of engagement through experiential encounters and connected knowledge, with the ultimate objective of the educator to become obsolete.